· Amorphous conductive media (wire): perfectly homogeneous, grain-less conductor, identical in all directions because it has no crystal structure at all. · Electrical resonance control: the advantage of distributed LITZ. · Mechanical resonance control: (dielectric and jacketing mechanical properties: optimized density and damping. Too much damping usually sterilizes and deadens the sound. Too little damping is even worse since it's prone to excessive “ringing” (unwanted uncontrolled resonances). · Characteristic impedance control: optimized relationships among capacitance, inductance and DC resistance). The Indra’ characteristic impedance and its resonant behavior (“Q” at RF frequencies) are different from the vest majority of other cables. The overall reactance of the Indra v10 is about twice as low as for the (previous) Indra 08 and earlier Indra revisions. 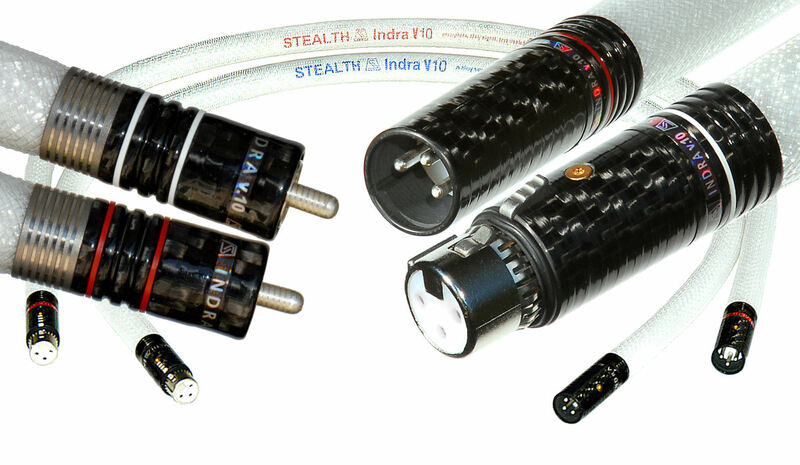 · Proprietary STEALTH connectors: custom and highly advanced (re-designed especially for the Indra v10); very low overall mass, solid silver contacts, machined ultra-modified PTFE (Teflon®) dielectric, Kevlar composite frame, machined Carbon Fiber/Titanium shells. The early production (REVISION "EP")****, made until mid-2005) balanced Indra also had Neutrik XLRs; However, none of the production RCA-terminated Indra cables were ever made with Cardas RCA connectors. 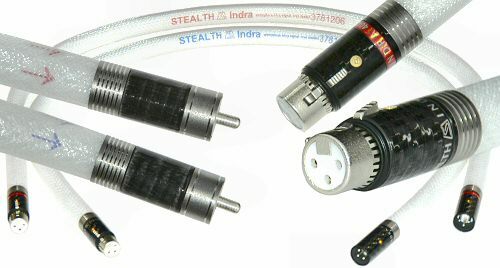 The early production (REVISION "EP") RCA-terminated Indra cables are shown at the picture below and features STEALTH designed and made proprietary RCA connectors. 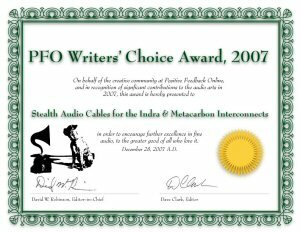 In 2007, we started experimenting with Ultra-modified PTFE (Teflon material), which lead to development of our newest proprietary connectors - both RCA and XLR - that use this type of Teflon instead of the conventional PTFE. The Ultra-modified PTFE features superior dielectric properties (reduced permeability and a lower dielectric constant - which offer even lower energy storage and further reduced "crossover-type" distortion in cables and connectors), better mechanical characteristics (significantly lower deformation under load, higher elongation and tensile strength - these qualities improve the "grip" of the STEALTH connectors on the chassis mounted counterparts), plus a pore-free and extremely smooth surface - preventing contaminates from being trapped in high purity applications. Appearance-wise, the Ultra-modified PTFE is similar to the PTFE, the only visual difference is a shade of blue in the Ultra-modified version. Please note the multiple grooves on one of the Titanium rings on the RCA connector, and machined Carbon Fiber shells with multigroove Titanium rings of these new XLR connectors - versus solid Titanium shells on the revision "P" 2005/2006/2007 XLR connectors. The center pin of the RCA connector has also changed: it now has a rounded tip and microgrooves for a better contact. If a contacts enhancer is used, these grooves would "hold" it better than a smooth pin. The latest up to date Indra V10 cables (REVISION V10) are shown below; the V10 is the most sonically significant revision for the Indra design since our switching from (beta) Cardas RCAs and Neutrik XLR to our own proprietary RCAs and XLRs for the production Indra; The Indra V10 features multi-core geometry (versus single core in all previous Indra revisions); Sonically, this provides for a greater bass extension and, most important - greater subjective "body" to the sound ("fuller" sound) - which is extremely difficult to get from any cable or equipment without compromising subjective clarity, openness and transparency. However, this is exactly what the Indra V10 sounds like: at least as open and transparent as the previous Indra revisions, but with more "substance". The STEALTH proprietary RCA and XLR connectors were re-designed for the Indra V10. The V10 RCA connectors allow at least 300 installations and re-installations without losing their "grip" on the RCA females. 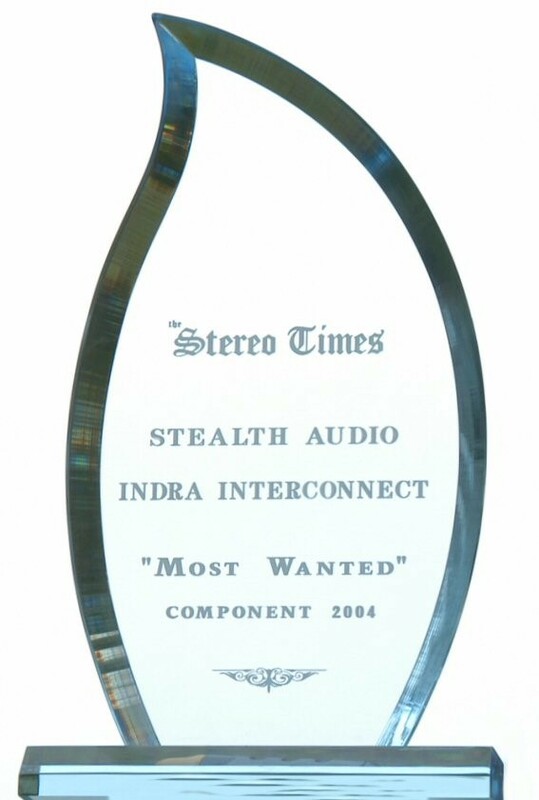 The Indra V10 is "officially" in production starting February 1, 2011. All other Indra revisions are no longer being made. When connecting the Indra cables with the STEALTH RCA connectors to equipment, please remember that you need to apply a significant axial force to make sure the Indra connectors go all the way onto the RCA females (on the back of an equipment piece). When you insert these connectors, the feel is like forcing a knife through a cold chunk of butter: it goes slowly and smoothly, but with significant resistance. Please be patient to overcome this resistance and DO insert the connectors all the way (deep) onto the RCA females. This usually requires either approaching your equipment rack from behind, or partially removing a component from a rack - to have a clear access to its back panel to insert the connectors using the axial force (along the connector's axle, along the cable). The internal part of the Indra V10 connector is made of solid silver and requires no special attention except for a regular thorough cleaning. The internal parts of the previous Indra revisions was made of Teflon, thus the following corresponds to the "EP", "P" and "08" revisions: "the internal diameter of the Teflon cylinder is slightly smaller than the RCA female diameter. When the connector is fist connected, the Teflon cylinder expands to reach the internal part of the titanium housing (the outer titanium ring on the connector). Once connected, the connector sits very tight on the RCA female, and the three solid silver strips, that make the actual contact, are pressed to the RCA female outer part. If the RCA female was cleaned right before inserting the Indra into it (with a contact cleaner or with simply rubbing (isopropyl alcohol), the connection between these strips and the RCA female is very firm, close to air tight, so it doesn't oxidize or deteriorate with time". 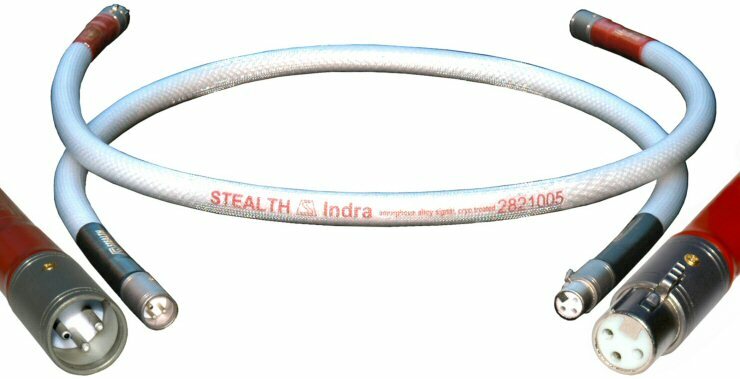 **STEALTH Distributed LITZ geometry: cable is multi-layered; wires are individually insulated, gently spiraled and run in opposite directions in layers which are next to each other; and the spiral diameter and the pitch is different for each wire. Thus, the wires inside a cable are separated by the far greater distance compare to their diameter, no wires run in parallel to each other, and no regular pattern is repeated throughout the cable. The distributed LITZ geometry offers dramatic reduction of electromagnetic interaction between strands of wire (both capacitive and inductive coupling are greatly reduced. The electrical resonances in distributed LITZ are considerably less pronounced than in any conventional geometry. This dramatically reduces RF resonance-related intermodulation distortion (one of the main distortion in cables). ***In simple, inexpensive cables, bare strands are twisted together and insulated as a whole. AS we know, the electric current (a music signal) tends to flow at the "skin" of the conductor, and thus jumps repeatedly from strand to another. Each strand of bare wire is covered by a thin oxide film, which means that in each “jump, the signal crosses two oxide boundaries. The most vital concern is that these oxide boundaries have semiconductor properties, the same properties that solid state diodes and transistors are built to have: it affects the signal passing through it by partially rectifying that signal. This effect is subtle-but imagine how many of these “little semiconductors” there are in a run of multistranded wire!.. With individually insulated solid core conductors, this negative effect is completely eliminated. 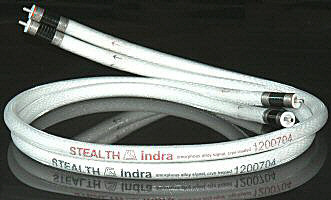 **** The revision abbreviations are given for information and identification of various Indra cables only: the cables are not marked - except for the Indra V10; We continuously improve our cables and connectors, and add improved and extra features to our products – as we design and test these improvements. The general sonic character of the cable remains the same, it just becomes progressively better and better.